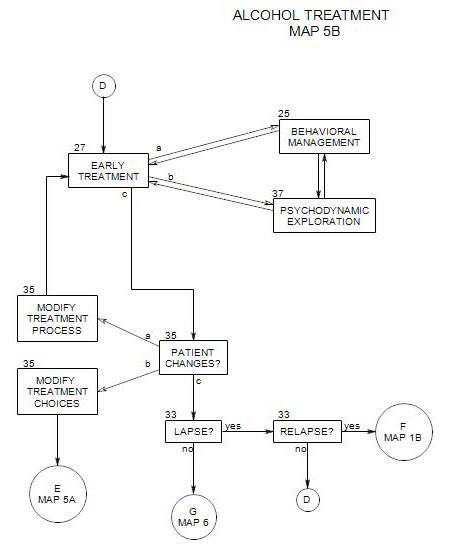 Early treatment with a recovering alcoholic patient involves two broad components:First, either choose between psychodynamic exploration and a behavioral management approach, or find some balance between the two. The choices are described in Section 27. Behavioral management is discussed in Section 25 and psychodynamic exploration is discussed in Section 37. As treatment progresses, watch for changes [Section 35] and modify the treatment process or your choice of treatment modality as needed.If things appear to be going well for a while [see Section 35 for this], watch for lapses and relapse [Section 33], and consider moving on.Successful completion of early treatment leads to later treatment [Map 6].